I made some little knitted flowers from a book I got at the library. It was fun making something small and quick. I was able to practice decreasing. I now know what k2tog means–so exciting! 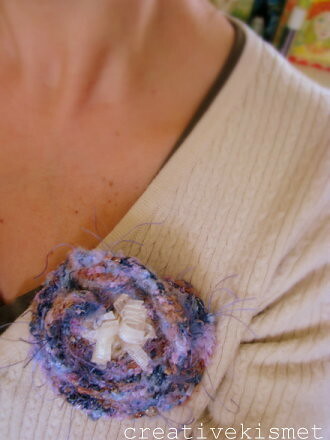 I used some yarn scraps that I had and turned the little flowers into brooches. Now I need to make a pretty little fabric basket to house my newly growing brooch collection. 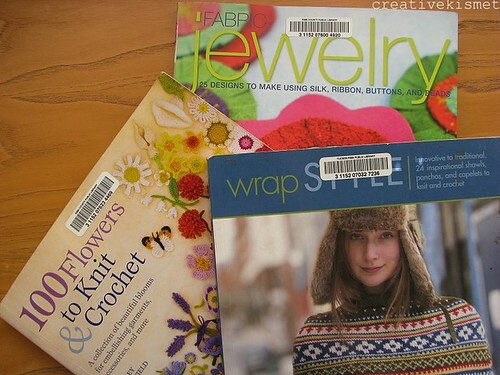 Here are some other books I borrowed from the library: 100 Flowers to Knit & Crochet, Fabric Jewelry & Wrap Style. They are all really great. Wrap Style has some beautiful wraps that I would LOVE to make. My favorites are in the above pic. Unfortunately, the patterns look like gibberish to me–makes no sense whats-so-ever. I really need to learn how to decode all those letters & numbers! I will though! It’s a big goal of mine to knit something other than hats & scarves before the years is done. 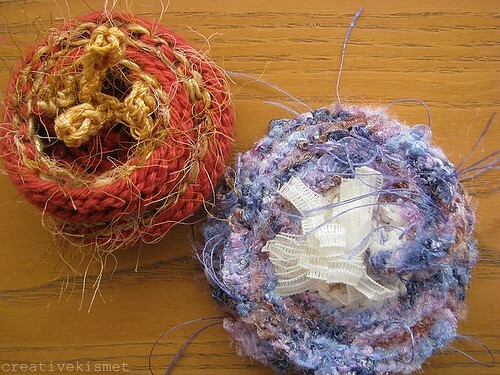 This entry was posted in Knitting/Crochet, Reading and tagged brooch, flowers, knitted broch, Knitting/Crochet, Reading. Bookmark the permalink. I know exactly what you mean about the knitting patterns. 2 Januarys ago I found I had a lot of time without a job and sat down and learned knitting patterns. It didn’t really take all that long, especially because each pattern I read had a legend before the pattern and I would refer to that as I knit. Some things are universal, like k2tog or m1 (make 1). Cables are the hardest because it seems like each person charts them out differently, so I’m constantly refering to the legend. I love the wraps you picked out by the way. These are beautiful wraps. I love the colors you selected for the knitted flowers, especially the purple. Wow I love the wraps. Looks so elegant. I love these! And I love the pretty feathery yarn you chose. I’m on a crochet kick at the moment, so I will have to check out the flowers to knit and crochet book. Thanks for sharing! Hey! Love your brooches! They are awesome! And the wraps too! Enjoy your website, keep up the good work. Those flowers do look fun to make. The wraps look so cozy! We have 12″ of snow right now. Hi There! Lots of beautiful things to see on your blog. 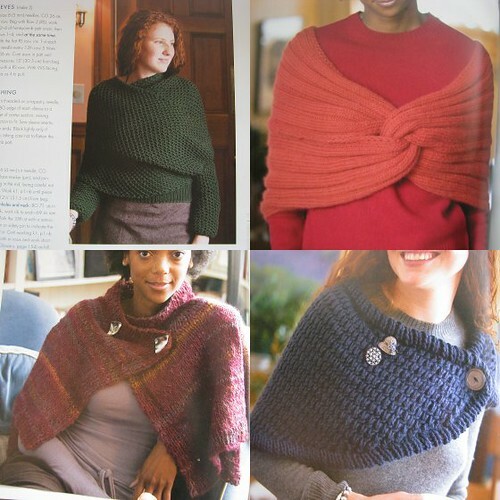 When I knit, I always keep a copy of one of my “how-to” knit books (like “Knitting for Dummies” for example) with my project. That way, I can look up directions in the pattern that make no sense to me. And having a reference right there means I don’t have to get up and find it. 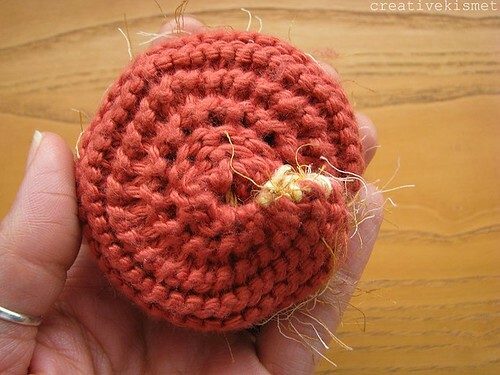 Knitting seems to be all about decoding the pattern. Once you do that, you’re golden!